Many nursing specialty groups in Canada have developed their own entry-to-practice frameworks to inform nursing curricula. This article focuses on the framework of HIV/AIDS core competencies developed by the Canadian Association of Nurses in HIV/AIDS Care. The goal of this pilot project was to map the courses offered in one entry-level program to assess the applicability of the framework as a tool to inform curriculum development. This project highlighted competencies that were well covered in the current courses offered in the program, as well as existing gaps. To address these gaps, five areas of improvement were identified. Dr. Gagnon is Associate Professor, and Ms. Cator is Research Assistant, School of Nursing, Faculty of Health Sciences, University of Ottawa, Ottawa, Ontario, Canada. Dr. Gagnon is a member of the Board of Directors and Expert Advisor of Policy, Research, and Advocacy of CANAC. Ms. Cator has disclosed no potential conflicts of interest, financial or otherwise. The authors thank the director, Dr. Dave Holmes, and the Assistant Director of Undergraduate Studies, Sylvie Corbeil, for their support throughout this project. The authors also thank the Board of Directors of the Canadian Association of Nurses in HIV/AIDS Care (CANAC) for their support and assistance. Address correspondence to Marilou Gagnon, PhD, RN, Associate Professor, School of Nursing, Faculty of Health Sciences, University of Ottawa, 451 Smyth Road, Ottawa, Ontario K1H 8M5, Canada; e-mail: marilou.gagnon@uottawa.ca. According to the most recent data published by the Canadian Nurses Association and the Canadian Association of Schools in Nursing (CASN), more than 15,000 nursing students are currently enrolled in entry-to-practice programs in Canada (Canadian Nurses Association, CASN, 2013). The majority of these students are enrolled in university-level baccalaureate programs. These programs are designed for entry-level nursing practice, with each course intended for generalist nurses who are expected to acquire knowledge and develop competencies that are minimally required for clinical practice in Canada. It is important to note that although these programs are accredited based on the same standardized framework (CASN, 2014a), the curriculum itself is not standardized. In fact, the curriculum can be changed and adapted by each program to better reflect particular regional, social, professional, and institutional contexts. Similarly, course content can be adjusted if it remains consistent with the entry-to-practice competencies outlined by professional regulatory bodies. Over the past few years, many specialty groups have developed their own entry-to-practice frameworks in an attempt to clearly outline what is expected of generalist nurses in their respective fields of practice and to ensure that nursing curricula across Canada reflect these expectations. For example, an entry-to-practice framework has been developed by CASN specialty groups in public health nursing (CASN, 2014b), as well as in palliative and end-of-life care (CASN, 2011). A framework of core competencies for psychiatric and mental health nursing was also developed by the Canadian Federation of Mental Health Nurses (2009). This article focuses on the core competencies for HIV/AIDS nursing education developed by the Canadian Association of Nurses in HIV/AIDS Care (CANAC, 2013). These competencies were developed not only to inform curriculum development but also to assist educators in ensuring that all nursing students in Canada are prepared to provide safe, compassionate, competent, and ethical care to people living with HIV (PLWH). In 2012, CANAC released a position statement on nursing education to outline the minimum content that should be included and covered in all undergraduate nursing programs in Canada. The statement was primarily developed as a response to many (ongoing) issues in entry-level nursing education in Canada, including, but not limited to (a) minimal or no theoretical content on HIV/AIDS and its broader social, cultural, political, legal, and historical contexts in undergraduate nursing programs; (b) minimal or no clinical experience with PLWH in clinical rotations; (c) new graduates lacking awareness and understanding of professional responsibilities in the context of HIV/AIDS nursing care, especially with respect to patient confidentiality; (d) new graduates entering practice without the basic minimum level of knowledge necessary to provide safe and competent care to PLWH; and (e) ongoing HIV-related stigma and discrimination in health care settings. In the position statement released by CANAC (2013), it was recommended that all programs include a minimum of 6 to 12 hours of theoretical content on HIV/AIDS nursing and provide opportunities for students to work with PLWH during clinical rotations. In addition, it was recommended that elective courses in HIV/AIDS nursing be offered in geographic areas that are most affected by the HIV epidemic, including areas where people are most at risk for and are vulnerable to HIV. Finally, it was determined that four main categories of core competencies should be integrated to nursing curricula: (a) HIV prevention, testing, treatment, and care; (b) psychosocial, spiritual, ethical, and legal issues related to HIV/AIDS; (c) psychomotor skills necessary to provide HIV/AIDS nursing care; and (d) professional expectations required in the delivery of HIV/AIDS nursing care. These categories helped to guide the development of a position paper, which was released the following year (CANAC, 2013). Table 1 provides a summary of the core competencies. The goal of this pilot project was to map out the current courses offered in entry-level education, using the HIV/AIDS nursing core competencies framework. The process of mapping competencies is not new to nursing. In fact, it is often used to identify gaps in course content and to inform curriculum development internally or as part of research on education (Musselwhite, & Freshwater, 2006). For this reason, it was considered to be an appropriate and relevant approach to assess the extent to which students are provided with opportunities to develop the CANAC competencies listed above in the existing nursing curriculum. 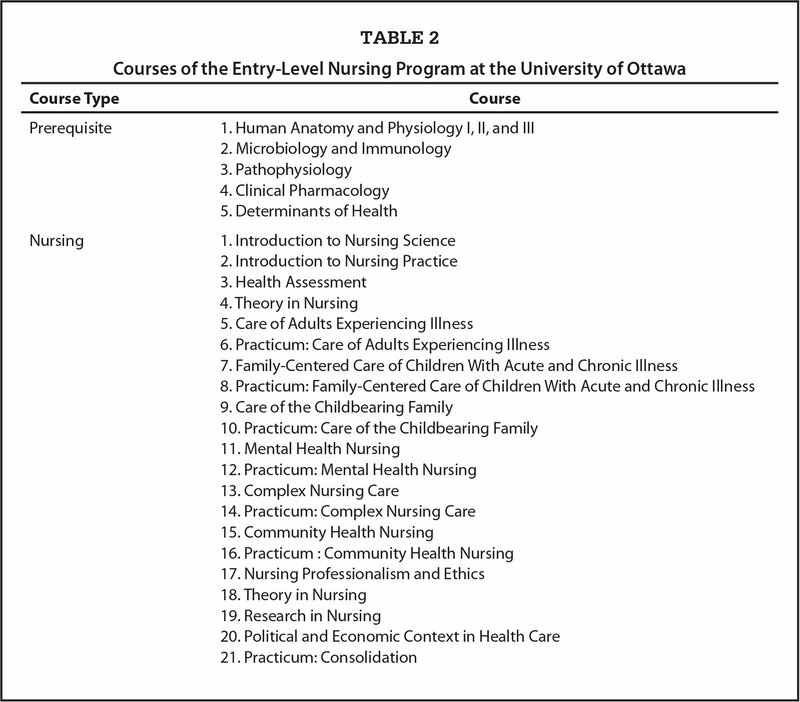 For the purpose of this project, the authors mapped the courses offered in the collaborative entry-level nursing program at the University of Ottawa. This program is offered on three separate campuses and includes approximately 1,800 students. It is also offered in both French and English languages. Most importantly, the program has 31 faculty members, with five (16%) having some expertise in the field of HIV/AIDS. During data collection, the authors obtained copies of the course outlines (syllabi) for the 21 nursing courses (including clinical practicums) and seven prerequisite courses (i.e., Anatomy, Microbiology, Pathophysiology, Pharmacology, and Social Determinants of Health) offered in the program (Table 2). The authors also considered readings that were assigned for each course and the assignments required for students to pass the course. Additional information was also gathered by e-mailing the course professors directly and by consulting the assigned readings for group discussions (i.e., Nursing Professionalism and Ethics course). Following data collection, mapping was conducted by cross-referencing the course outlines (and related materials) with the HIV/AIDS nursing core competencies. This process was completed using an Excel® spreadsheet with three columns—course code, related competencies, and notes. Results were then compiled in Excel tables and converted to graphics to visually represent the actual coverage of the competencies within the program. For the purpose of this project, coverage was defined as the number of times that competencies were covered per course and not the extent to which they were covered in the courses themselves. That level of analysis will be included in a more extensive project that is planned to be conducted in 2015–2016. It is important to note that a senior nursing student (S.C.) was involved at each step of the data collection and data analysis. The student was able to draw from firsthand experiences to guide the data collection process and participate in data analysis. Having the same student involved in both the preparation phase (i.e., literature review) and the dissemination phase (i.e., conference presentations) of the project allowed for a richer interpretation of the findings and for the development of recommendations that took into consideration the highlighted gaps in the program, as well as the nursing literature. Overall, the ability to bridge the educator–student perspectives at every step of the project proved to be a valuable strategy. It contributed to the quality of the project and to the emergence of new ideas, which the authors plan to pursue in subsequent larger scale projects. The main findings of the pilot project are presented in this article. To demonstrate how these findings relate to the existing nursing literature, the authors present and discuss the findings simultaneously. Although this approach may be unconventional, it allows for connections to be made between the findings and what is known on the topic. For this project, literature published as far back as 1999 was included and deemed relevant because much of the empirical studies published on the topic emerged in the late 1990s and early 2000s. Although the field of HIV/AIDS has evolved dramatically since the 1990s, educational gaps in entry-level education have not. This will be clearly outlined in the following sections. The findings revealed similar coverage of the core competencies between the French and the English language programs. During the analysis, the number of times each competency category was covered in both programs was documented, but this process created a disproportionate representation of categories that are more specific to HIV/AIDS, such as core competency categories 1 and 2. Instead, the authors documented the number of courses covering each competency category as a first step in the analysis. This not only allowed for the assessment of coverage of the categories more broadly, but it also was the start for identifying potential gaps in the curriculum and the opportunities to build on what was already being covered. For example, in both French and English language programs, category 1 was covered only in three courses, whereas category 4 was covered in 18 courses. Although this finding came as no surprise, it reinforced the importance of looking beyond the actual coverage of competencies that are generally well represented in the curriculum and focusing on the application of these competencies in clinical practice. This is consistent with nursing research, suggesting that professional practice competencies learned in the classroom are not always reflected in the attitudes of nursing students toward PLWH (Pickles, King, & Belan, 2009). Only two nursing courses were mapped against the competencies listed in category 1 (i.e., the Complex Nursing Care course and the Community Health Nursing course). Both of these courses are offered in the last year of the program, meaning that students have little or no exposure to HIV content for the first 3 years of the program. During the analysis, it was noted that basic knowledge on HIV is not covered in prerequisite courses such as Human Anatomy and Physiology, Pathophysiology, and Microbiology and Immunology. Not surprisingly, this knowledge is also lacking in clinical practice because it has not been traditionally incorporated into nursing education (Watkins & Gray, 2006). Ensuring that students develop a basic understanding of HIV in prerequisite courses is important because misconceptions about HIV/AIDS and, more specifically, about HIV transmission, are common among nursing students (Pickles et al., 2009). Such misconceptions are known to impact the attitudes and practices of nursing students, including their fears of contracting HIV and their willingness to provide care to PLWH (Bektas, & Kulakac, 2007; Durkin, 2004; Li, Scott, & Li, 2008; Pickles et al., 2009; Röndahl, Innala, & Carlsson, 2003; Stavropoulou et al., 2011). Prerequisite courses, such as Human Anatomy and Physiology, Pathophysiology, and Microbiology and Immunology, provide essential background knowledge on which to build nursing courses that focus on HIV/AIDS nursing care, rather than on the virus itself. Similarly, Pharmacology courses are essential for nursing students to develop a general understanding of antiretroviral medications (competency 1.11) and their adverse effects (competency 1.13). These two competencies are minimally required for nurses to provide safe and competent care to PLWH. However, research suggests that nurses have significant knowledge deficits with respect to medications, adverse effects, and medication adherence (Watkins, & Gray, 2006). During the analysis, both Pharmacology and Complex Nursing Care courses were mapped to these competencies. Although this is a positive finding, it is not representative of nursing curricula across Canada. The same applies to competencies 1.3 to 1.10, all of which were covered in a 3-hour class during the last year of the program. It is impossible to assess whether these competencies are actually covered in other nursing programs. However, it is unlikely that they are covered to the extent they should be, given the knowledge deficits that are reported in the literature and in clinical practice. Nursing courses mapped fairly well against the competencies in category 2. However, it was quickly noted that these competencies were covered in general, rather than being specific to HIV/AIDS. For example, in courses where students are expected to learn about the psychosocial, legal, and ethical dimensions of care, content related to HIV/AIDS (i.e., readings, case scenarios, examples) was not included. The authors identified many missed opportunities to inform students of their obligation to care for PLWH and to provide care in ways that are consistent with ethical, legal, and professional standards. This is particularly important because research suggests that nursing students hold beliefs that are not consistent with these standards when they find themselves in situations where they have to care for PLWH (Relf, Laverriere, Devlin, & Salerno, 2009). Unless educators specifically address issues related to informed consent, HIV testing, confidentiality, and disclosure in the classroom and in clinical settings, these beliefs can be actualized and lead to unethical practices, such as forced HIV testing, unauthorized HIV disclosure, breaches of confidentiality, and inappropriate use of precautions (Relf et al., 2009). They can also result in the discriminatory treatment of PLWH, such as nurses refusing to provide care to PLWH (Chan, 2009; Peate, Suominen, Valimaki, Lohrmann, & Muinonen, 2002). To conclude the presentation of the study findings, the authors briefly discuss the mapping of competencies 3.1 to 3.7. Although psychomotor skills are generally well covered in entry-level nursing education, two areas of improvement were identified that would require minimal changes in the existing curriculum. The first area of improvement is regarding standard (universal) precautions, which are known to pose a challenge to nursing students in the context of HIV/AIDS (Pickles et al., 2009). In total, three courses were mapped to competency 3.1. During the analysis, it was apparent that the appropriate use of standard (universal) precautions was taught to nursing students. However, issues related to the inappropriate and inconsistent use of standard (universal) precautions did not receive as much attention. Yet, studies have shown that nurses modify their use of personal protective equipment based on the serological status of their patients (Preston, Forti, & Kassab, 2002). For this reason, students should be provided with scenarios that explore both “good” and “bad” practices. The second area of improvement would be to better prepare students to engage with harm reduction education (i.e., safer injections, condom use) when working with individuals who are at risk or living with HIV. This pilot project was intended to serve as a foundation for future applications of the HIV nursing core competencies framework and a more comprehensive mapping project. As such, it was largely designed to assess the applicability of the competencies framework as a tool for identifying existing gaps in entry-level nursing education and to inform curriculum development. On the basis of the authors’ experience, the framework was considered to be an excellent tool in this regard. However, educators and researchers are advised to proceed cautiously when mapping these competencies due to issues such as over- and underrepresentation. Through this process, the authors learned that mapping professional practice competencies can result in an overrepresentation of courses where students learn about professional values and standards. Unless direct opportunities are provided to apply these values and standards in the context of HIV/AIDS and reflect on what ethical practice means in this context, students may make practice decisions based on their own beliefs, values, and attitudes. This was demonstrated in the study by Relf et al. (2009) in South Africa and in the United States. In that study, the majority (76.3%) of American students held beliefs that were not consistent with the ethical standards of nursing practice (Relf et al., 2009). Mapping competencies based solely on information gathered in course outlines and through limited personal communications with professors can also result in underrepresentation of some competencies. However, depending on the purpose of the mapping exercise, this may not be an issue. For example, it may not be an issue if the framework is used for internal purposes as a way to reflect on competencies that are covered or those that are not covered. However, it may become an issue if mapping is used to inform curriculum changes or for research purposes. For future applications of the framework, the authors recommend collecting additional data, using questionnaires, interviews, or focus groups with both students and faculty, such as in the study by Musselwhite and Freshwater (2006). The authors also recommend involving senior nursing students in the process because they bring a valuable perspective when mapping what is or is not being covered in the curriculum. The fact that a senior nursing student was involved in the data collection, data analysis, and dissemination of the findings added tremendous value to the current project. It also helped to contextualize the findings and find opportunities to incorporate HIV/AIDS nursing competencies within the existing structure of the program. Include HIV pathogenesis and HIV medications as standard items in prerequisite courses (i.e., Anatomy and Physiology, Pathophysiology, Microbiology, and Pharmacology). Incorporate evidence-informed and up-to-date knowledge on HIV prevention, testing, treatment, and care in existing nursing courses throughout the program. Apply ethical principles to the context of HIV, using case scenarios that require students to reflect on their own beliefs while learning about their professional obligations. Explore the meaning of standard (universal) precautions with students and expose them to a range of case scenarios where precautions are overused, underused, and used correctly. Provide opportunities for students to learn about the risk of occupational exposure to HIV and the science of HIV transmission to reduce irrational fears and increase comfort level. In light of the current project, the authors stress the importance of combining education and training with actual clinical experiences with and exposure to PLWH (as patients or guest speakers). Education and training alone has been shown to work in previous research conducted with nursing students (Carney, Werth, & Martin, 1999; Valois, Turgeon, Godin, Blondeau, & Cote, 2001). However, when hands-on experience and personal contact with individuals who live with HIV/AIDS is included, the impact on attitude and practice intentions is greater than education and training alone (Yiu, Mak, Ho, & Chui, 2010). This article demonstrates that the inclusion of HIV nursing core competencies in entry-level programs is essential to ensure that nursing students are prepared to provide safe, compassionate, competent, and ethical care to PLWH. Drawing on the framework developed by the CANAC, the current study provided an overview of core competencies in HIV nursing, as well as the process used to map these competencies at the University of Ottawa. The findings of the mapping project were presented and discussed regarding how they relate to the existing literature on the topic. Finally, the lessons learned and the implications for nursing education were presented. The findings support the need to include the basics of HIV nursing care in entry-level education and provide opportunities to apply professional practice competencies to the context of HIV. The gaps identified over the course of the project are consistent with those identified in the existing nursing literature. As such, the recommendations provided in this article will help to guide the development of new initiatives to increase the coverage of HIV nursing competencies in entry-level education in Canada and elsewhere. Carney, J.S., Werth, J.L. Jr.. & Martin, J.S. (1999). The impact of an HIV/AIDS training course for baccalaureate nursing students. Journal of Nursing Education, 38, 39–41. Durkin, A. (2004). Comfort levels of nursing students regarding clinical assignment to a patient with AIDS. Nursing Education Perspectives, 25, 22–25. Stravropoulou, A., Stroubouki, T., Lionaki, A., Lionaki, S., Bakogiorga, H. & Zidianakis, Z. (2011). Student nurses’ perceptions on caring for people with HIV. Health Science Journal, 5, 288–296. Valois, P., Turgeon, H., Godin, G., Blondeau, D. & Cote, F. (2001). Influence of a persuasive strategy on nursing students’ beliefs and attitudes toward provision of care to people living with HIV/AIDS. Journal of Nursing Education, 40, 354–358. HIV prevention, testing, treatment, and care 1.1. Psychosocial, spiritual, ethical, and legal issues related to HIV/AIDS 2.1. Psychomotor skills necessary to provide HIV/AIDS nursing care 3.1. Professional expectations required in the delivery of HIV/AIDS nursing 4.1.